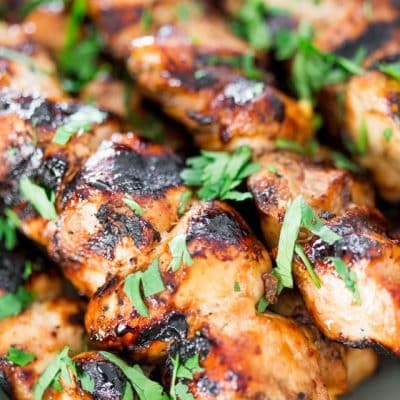 Incredibly delicious Beer and Honey BBQ Chicken Skewers that are perfect for a weekend or even a busy week night. Just prepare the night before, let them marinate overnight and grill when ready. For as long as I can remember I’ve always hated beer, I could never understand the fascination with it. I always found it bitter, I’d much rather enjoy a cocktail or just a pop. So my parents never had to worry about me drinking their beer. As a matter of fact alcohol was never my thing, probably because I can’t hold my liquor. One drink and I start singing Gloria Gaynor. Ok, we don’t want to go there. But I do remember years ago when my parents went on vacation and left my sister and I alone, we were actually around 19 or 20. Back then my dad used to make his own wine and sherry and we used to have a cellar in the basement where he’d keep the barrels. Mom and dad if you’re reading this, this is the honest truth. For some unknown inexplicable reason just when they were gone for that week the barrel of sherry decided to explode all over the cellar. No lie! I have no idea why, my guess is something to do with temperature and pressure, but who knows, I’m no expert. As you can imagine this did not look good on my sister and I. We spent an entire day cleaning up sherry from all over the cellar walls and other bottles and cans in there. But I don’t think that to this day my parents believe us, I think they still think we had a huge party and drank all the sherry. While I’ll admit to having a party, we DID NOT drink that sherry, I wish we had, it was really good. Glad I got that off my chest. Back to the beer thing. Never liked beer but then I got married. My husband taught me to appreciate a good beer, and although I can’t call myself a beer drinker now, I will occasionally enjoy a beer on a hot summer day. I have also learned to appreciate the power of beer in cooking, especially in marinades. The beer tenderizes the meat and it gives it tons of great and delicious flavor. So for this incredible marinade here I used a darker ale, though any beer would work, and I mixed it with honey, and soy sauce and a bit of Dijon mustard. I let the chicken marinate for a good couple hours, obviously the longer you leave it the better it will taste and the more flavor it will have. One thing you could do is prepare this the night before and let it sit and marinate in the fridge until next day when you come back from work. Then all you’d have to do is thread the chicken on skewers and grill ’em. Cut chicken in small pieces, about 1 1/2 inch cubes. In a medium bowl whisk all the marinade ingredients together. Add chicken, there should be enough marinade to cover the chicken. Cover with plastic wrap and place in fridge. Let it marinate for at least 2 hours to 24 hours. Thread chicken on skewers, about 5 pieces per skewer. Do not throw away the leftover marinade. 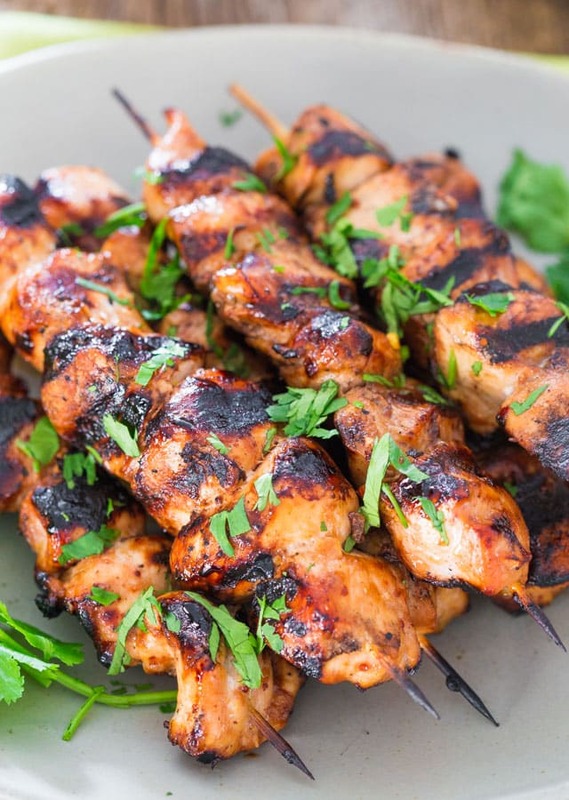 Place chicken skewers on grill and turn every couple minutes or so, at the same time brushing some of the leftover marinade over the chicken, if preferred. Grill until chicken is cooked through. 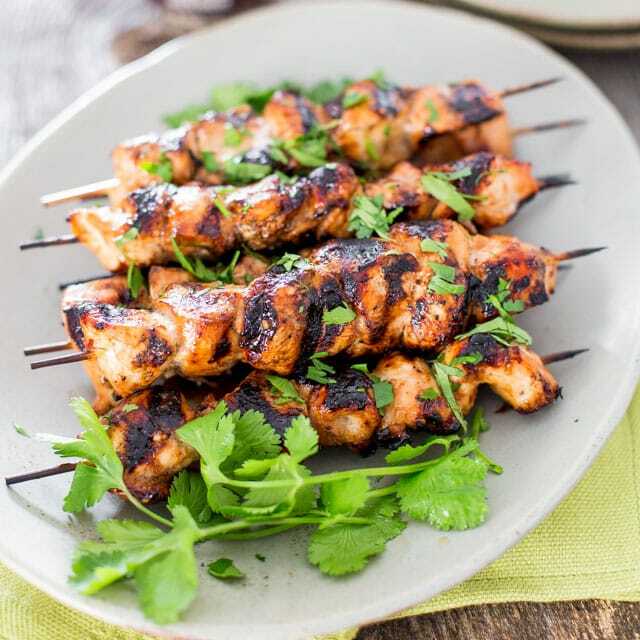 Since the marinade had raw chicken in it, if you're brushing over the chicken as you're grilling, make sure to not brush all the way till the end, allowing the chicken to cook. 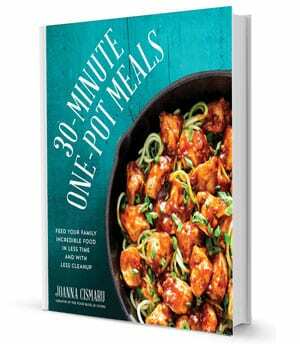 Alternatively, you could cook the marinade in a small saucepan, bring it up to a boil and then simmer for 5 minutes. Use this to brush over the chicken as it grills. Make sure to soak your skewers in a casserole dish, fully immersed in water. You can prepare this the day before. Wonderful! Whole family enjoyed! It’s was fun watching my 6 year old eat! A little spicy for him with the red pepper flakes. 😀 Will make again for sure! Well, I’m now really hungry! 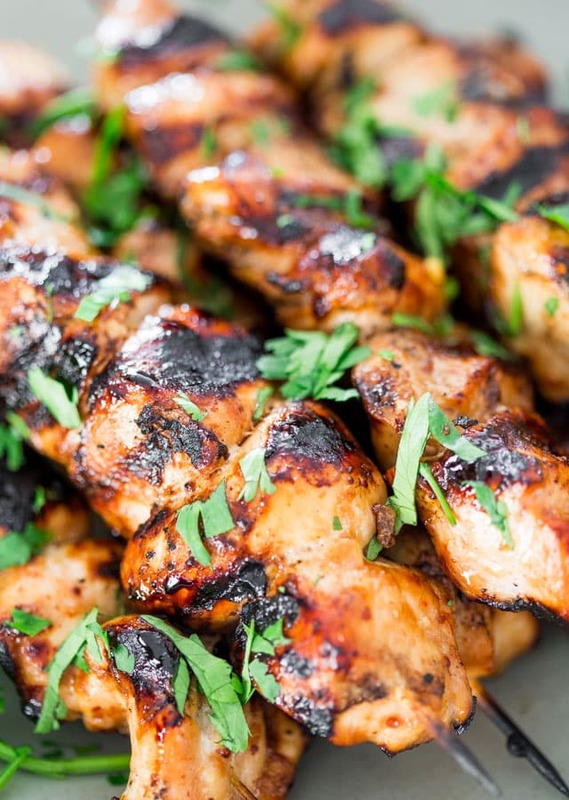 These looks so delicious, perfect for our Sunday BBQ party!